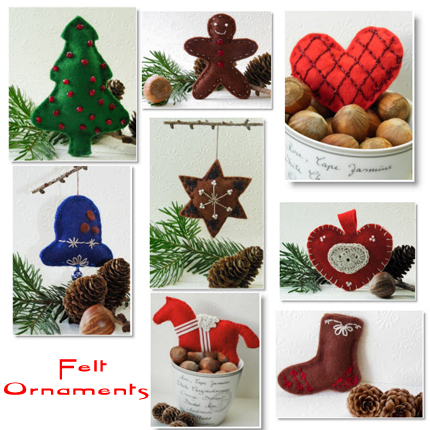 This year Birgit who lives in Denmark made the cutest Christmas ornaments with thin felt. She didn’t have to use any specific patterns, but looked for inspiration online and added her own personal touch to each project. She has a Felt Horse Ornament, Felt Gingerbread Man, 5 + 6 Felt Stars, Felt Heart Ornament, Felt Christmas Sock, Christmas Felt Bell, Felt Christmas Tree and Felt Heart Ornament. You can hang the ornaments in the Christmas tree or make garlands with them. Gift toppers are always cute and Birgit of “By Nnumber19” did an amazing job, thanks for sharing. LIKE “By Number 19” on Facebook. The ornaments are fast to make with the ready to cut out templates. Also a great kid project for learning to sew simple things.